According to researchers at the University of Leuven, 1.5% of all visits to an emergency room in Flanders is due to an injury sustained jumping on a trampoline. The goal of the research was to create recommendations to improve safety standards of trampolines, which are becoming more and more popular in families’ back gardens. Most of the injuries are to the arms, with fractures to the forearm being the most common. One in 10, however, are head injuries, some of which have caused neurological damage. 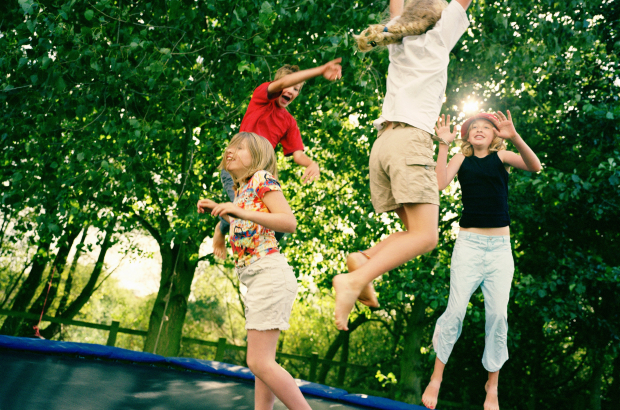 Injuries mostly happen because a child falls from the trampoline while jumping. The number one rule for trampolines, Stefaan Nijs of Leuven University Hospital told VRT, is to jump alone. “We see that when multiple children jump at the same time, that’s when the risk of injury is greatest.” The risk is greatest to smaller children because they can be catapulted too high by the larger children. Nijs also said that a covering for the metal infrastructure of the trampoline could cut down on injuries and that there must be a diameter of at least two metres around the trampoline that is free of other objects.